Yesterday I woke up to find a tweet from the lovely Marissa at Makin' it with Marissa saying that she'd nominated me for the Liebster award. 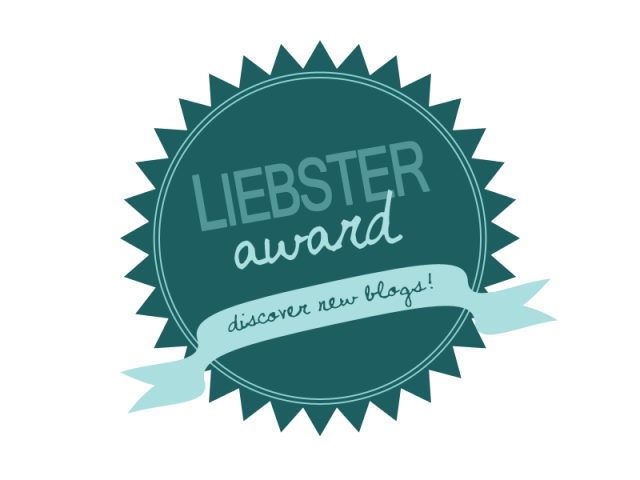 While not an actual award, the Liebster award is a promotion meant to introduce the world to other up-and-coming blogs that are worth checking out. As a much lesser-known blogger myself, I was honored to be chosen by a blogger I admire so dearly as a blog worth reading. So, here’s how it works: I answer the questions then nominate up to 11 other up-and-coming bloggers of the same genre blog of mine to partake in the same process. How did you decide on the title of your blog? I saw something similar to my title on Tumblr and it really hit home. As a college student, I'm obviously on a budget, but I pride myself on being fabulous despite my minimal funds. I've always loved fashion and fashion-based media. I also have a journalism background but found I always preferred writing blog posts to newspaper articles. I had to have a Blogger blog when I went on exchange and found I really liked it as a way to express myself. I started this blog in particular because I felt (and still feel!) I have something new to offer the world of style blogging. 12 oz latte, be it at Starbucks or the cafe on campus or a local coffee shop. I love consignment stores. I know I talk about this, like, way too often, but I love the wide range of styles and the deals that I can score without working too hard. I have so many trips on the back burner! France and Spain with Lauren, Eastern Europe with my dad, Disneyland with Erin, and Canada with Maddie are just a few. My usual answer to this question, though, is the Middle East. I never thought I'd be one of those owners that dresses her dog in stupid outfits, but I love dressing up my pup. I try to only dress her when it's necessary – i.e. cold weather, and rain – but sometimes it's all too cute to resist! I have no idea what I will be doing in 5 years! Like, not even a semblance of an idea! But I do know I want to in a position to do what I want, be that career-wise, traveling, or otherwise. I'm obsessed with Willow Smith right now. She has a beautiful voice, both musically and as far as her message is concerned. Check out my 8tracks profile to see more of my favorite music. What is one piece of advice you’d give to other new bloggers? Find your voice and don't ever be afraid to use it. Even though it may often feel like you're one of millions of others with the same intention in blogging, you are unique in that you have a different perspective because it is your perspective. Don't try to mimic other blogs and don't scare yourself into being bland. Where do you see your blog going in the next year? How I'm staying organized this year: my @lillypulitzer agenda, a @whitv blog planner, and lots of color coding. Again... I have no idea. As much as I try to plan and predict, it seems like everything I expect ends up going just slightly differently. I hope to strengthen my brand and readership in the next year, and continue to use it to express myself. I primarily find inspiration in my passion to express my expensive sense of style on a less-than-desirable budget.